When should we send push notifications to our users? From notification messaging to the in-app experience, mobile app marketing has become the new main channel for customer engagement amongst the vast sea of lit up smart devices. What’s more, it is one of the most precise methods for penetrating niche markets, given that they have already adopted the new digital era. Apps are a great tool for delivering reminder ads to your current customers in order to keep their attention on your brand. But when exactly is the right moment to send them messages and how often should you do so without seeming too pushy? In a recent report by Leanplum Inc., we found a lot of answers to shed some light on the right approach to mobile app marketing. It turns out that smartphone users spread across different regions have a diverse set of interests. They are more likely to engage with certain app verticals, depending on where they reside. For instance, the research shows that iOS users prefer to engage with travel apps, while Android users show more interest in retail and media. Those who favor Windows OS also show higher engagement with travel apps. But when exactly should we send push notifications and how often should we try to engage our mobile audience? That is the question we sought out to find and write the wrong with app messaging practices, leaving place only for efficient and precise target engagement. 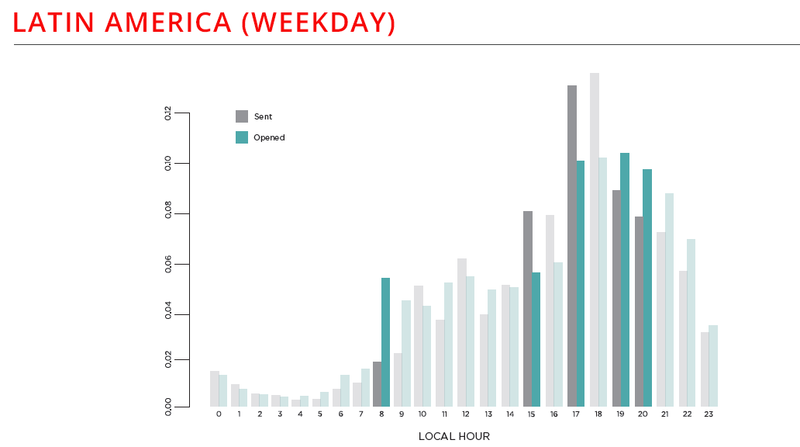 Findings: On weekdays in North America, sent notifications spike during morning computer hours, lunch breaks, and after school ends. App engagement is particularly high when kids get home from school and it takes peak at 7 p.m., when people sit down for dinner, which breaks our traditional belief “not to call at dinner”. It turns out that when users are most engaged during relaxing night hours, apps actually have the least competition, and therefore the highest chance of grabbing their attention. Opportunity: Brands should send app messages after dinner, from 8 – 11 p.m. 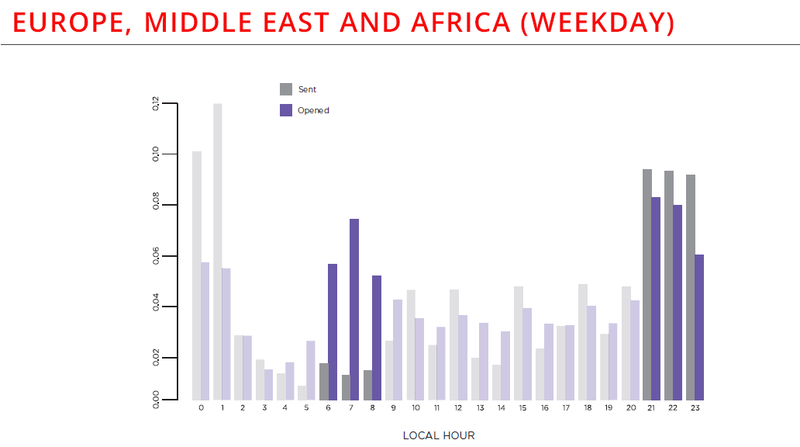 Findings: On weekdays in Europe, Middle East and Asia apps send notifications mostly late at night between 9 p.m. and 1 a.m. Unlike North America, here we see the complete opposite trend of mobile marketing. However, on weekdays users are much more likely to open push notifications in the morning hours before work. A quick look at the late night hours, between midnight and 1 a.m. reveals an alarming distortion, when sends peak, yet users aren’t that engaged. A possible explanation for this phenomena is that marketers in other geolocations fail to take into account individual time zones and send every notification at once. Opportunity: Instead of fighting for the attention of users at night, brands should instead target morning hours before work, from 6 – 8 a.m., when users are more likely to open. 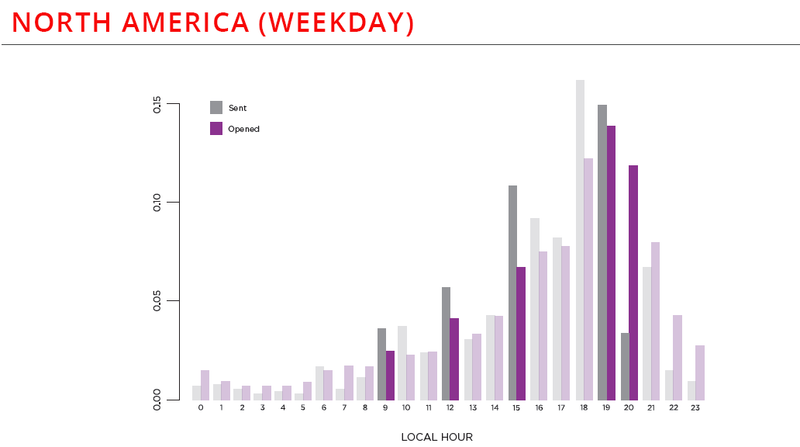 Findings: On weekdays in Latin America, customer engagement is high in the morning and at night. 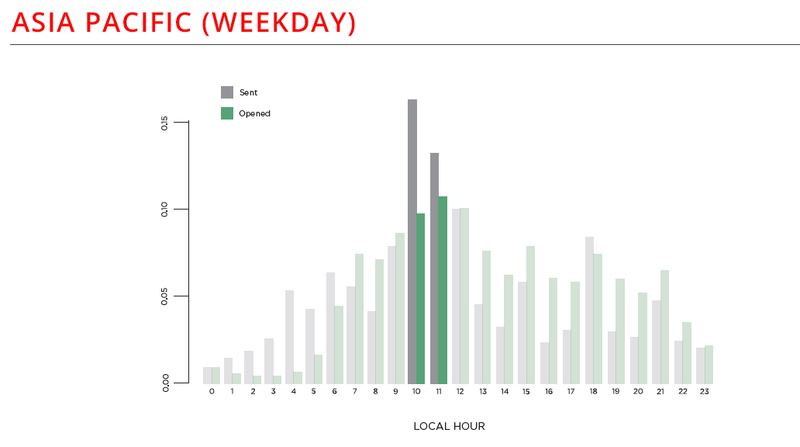 App interaction is quite high during commuting hours at 8 a.m. and then slightly drops during working hours. It increases again at 5 p.m. when people clock out and then notification sends enter into “happy hour”. Latin America’s results shows the highest correlation between sent and opened app messages. Opportunity: Brands should engage at 8 a.m. or after 7 p.m., rather than over send push notifications in the afternoon. Findings: Controversy to the rest of the world, on weekdays in Asia Pacific push notification frequency is the highest in the late morning. User engagement also takes peak during that time between 10 and 11 a.m. However, there is a gradual increase of morning app usage starting as early as 7 a.m., which marketers fail to see. What they actually do is that they flood users with messages at 10 – 11 a.m., making their battle for attention extremely difficult. Opportunity: Brands should send pushes earlier from 7 – 9 a.m. to have a better chance at engaging their audience, but also try to benefit from afternoon hours and dinner time when people are using their smartphones. Using data and metrics to measure and track your success is essential to increasing user engagement and retention on mobile. This data is extremely useful because it provides valuable insight into mobile marketing opportunities. It is evident that far too many apps are sending push notifications at the wrong time, when users aren’t likely to open them. If these statistics caught your attention and made you rethink your mobile marketing approach, don’t forget to download the full report, containing more data on app messaging, must-read best practices and a toolkit to optimize your delivery times.